When Pamela Jo Berry decided her Miller Park neighborhood needed more art options, she created the presenting organization North Omaha Summer Arts in 2011. Nonprofit NOSA is still going strong in 2018 and its annual culminating event, An Arts Crawl, takes place Friday, August 10 from 6 to 9 p.m. at several venues in and around the North 30th Street Corridor. In addition to the Arts Crawl, NOSA annually features women’s writing workshops and retreats, a gospel concert in the park and pop-up events. Free eats and refreshments prepared by Omaha foodies and chefs are part of every event. 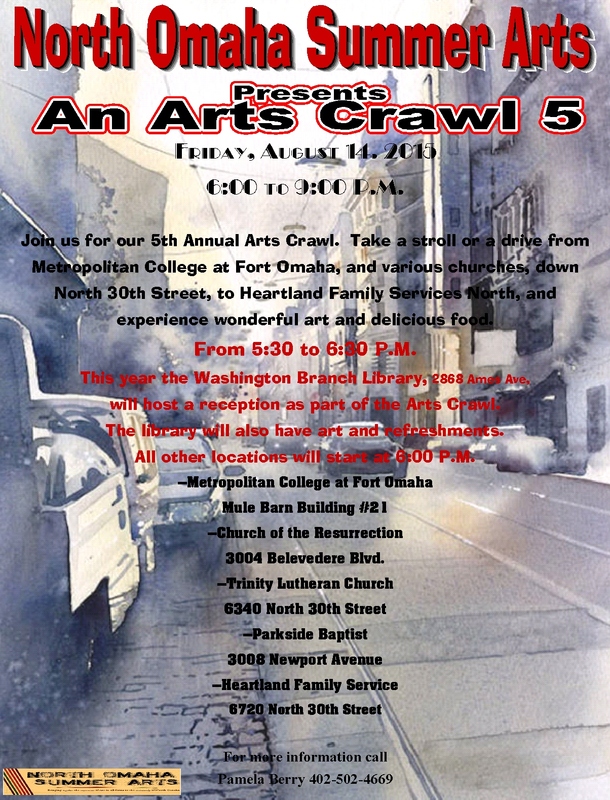 For the Arts Crawl, NOSA invites patrons to take a stroll or drive from Metropolitan Community College’s Fort Omaha campus to venues down North 30th Street to experience beautiful art and great food by visual, performing and culinary artists. Al reception kicks things off at the Charles B. Washington Branch Library, 2888 Ames Avenue, from 5:30 to 6:30 p.m. Area quilters will display their handiwork at the library. All other locations are open from 6 to 9 p.m. Proceeds north to Church of the Resurrection, at 3004 Belvedere Blvd. Continues onto Nelson Mandela School at 6316 North 30th St.
Ends at Trinity Lutheran Church at 6340 North 30th St. 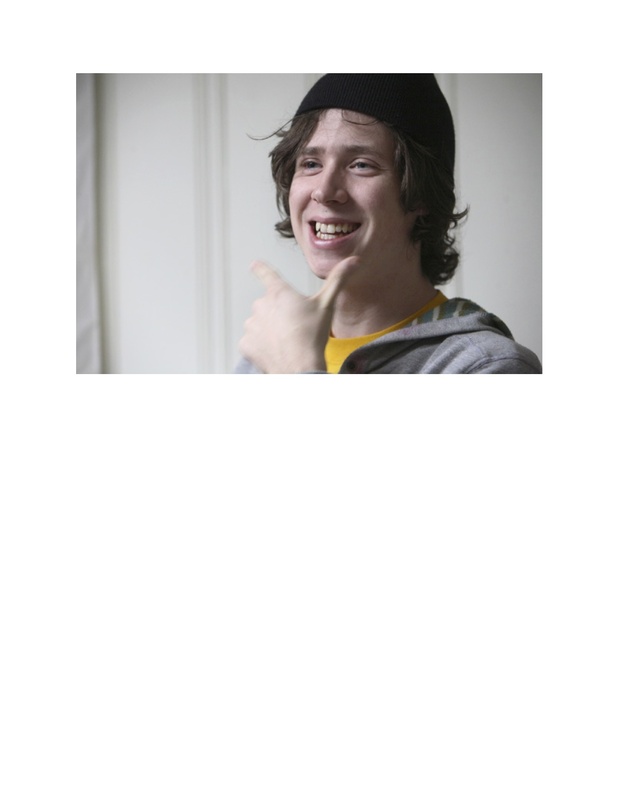 The venues will present a wide range of work. A one-man show entitled Shapes and Shadows by the late printmaker Galen Brown is at the Mule Barn Arts Center, The U.S. Marine Corps veteran and Purple Heart recipient served two tours of duty as a sniper in Vietnam. After returning home from war, he began making art as a way of emotionally healing himself. His images reflect the shapes and shadows of what he observed: war and peace, justice and injustice, landscapes, other artists’ work and his own cancer. At Church of the Resurrection Fort Calhoun-based artist Cheri Oelke will demonstrate her acrylic painting and talk about her creative process and artist’s life. The church’s sanctuary is also home to a signature triptych, “Crucifixion,” by the late artist Leonard Thiessen, which visitors can view. Children and adults will display their art at Nelson Mandela School. Art created by Omaha refugee communities and other area artists will be showcased at Trinity Lutheran Church. Live music performances will occur at select sites. NOSA is in its eighth year of presenting family-friendly, community-based art opportunities and events. For more information, call NOSA at 402-502-4669. 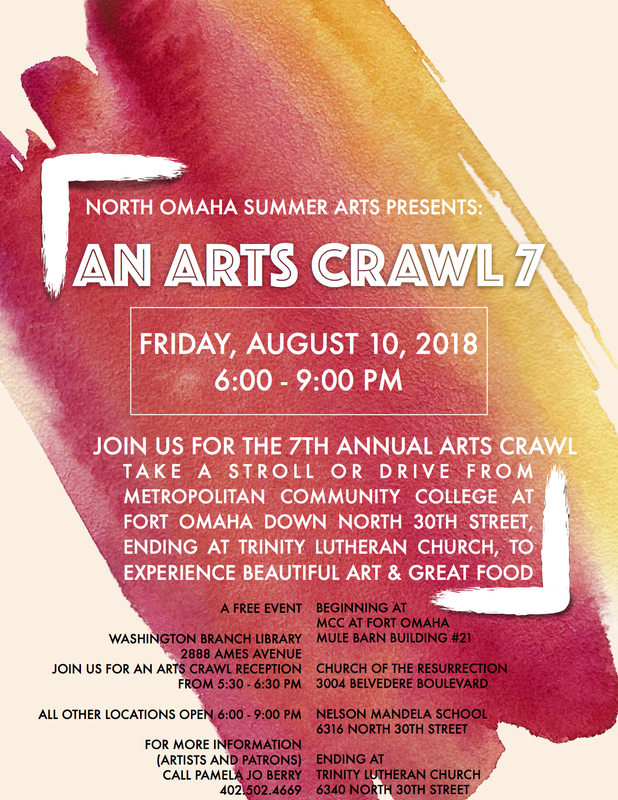 Take a stroll or drive from Metropolitan Community College Fort Omaha campus down North 30th Street, ending at Trinity Lutheran Church, to experience beautiful art and great food by North O visual, performing and culinary artists. Washington Branch Library, 2888 Ames Avenue, from 5:30 to 6:30 p.m.
All other locations open 6 to 9 p.m. The 2016 edition of North Omaha Summer Arts has seen the addition of new events and community partners and now NOSA’s gearing up for its 6th Annual Arts Crawl on Friday, August 12. Founded in 2011 by North Omaha resident Pamela Jo Berry, NOSA is an entirely free, summer-long festival dedicated to the proposition that the arts can heal and build community. Berry, a mixed media artist, saw a need to infuse more art in all its forms into North Omaha and to give artists more opportunities to explore and showcase their work. The festival features some recurring events, such as the gospel concert in Miller Park in June, an Art and Gardening class at the Florence Branch Library in July and the Arts Crawl in August. A weekly women’s writing series just concluded and its students’ work will be published in an anthology. New this year to the NOSA schedule are a variety of Pop-Up Art events, including the recent Thoreau Meets the Harlem Renaissance and Painting Bird Houses events. More Pop-Up Art happenings are planned. NOSA often works with community partners to present events, including recent collaborations with Compassion in Action, Girls Inc. and the Intergenerational Human Services Campus. The highlight of NOSA each year is the Arts Crawl. This walkable, continuous art show presents the diverse work of emerging and established artists at venues on or near North 30th Street. This year’s Crawl runs from 6 to 9 p.m. on August 12. It starts at the Metropolitan Community College Fort Omaha campus Mule Barn building and ends at the North Heartland Family Service – with Church of the Resurrection, Nelson Mandela School and Trinity Lutheran in between. The public is invited to walk or drive to each location to view art in various mediums, enjoy art demonstrations and speak with artists about their practice. Live music will be performed at some venues. Many of the featured artists are from North Omaha. For this year’s Crawl, each veteran artist is showing alongside a younger or less experienced artist with whom they share a close connection. For example. Gabrielle Gaines Liwaru is showing her art photography beside her daughter Cheamera Liwaru’s own photographs and Aaryon Lau Rance Williams is showing his paintings next to art created by youth from the after school arts program he operates. A reception kicking off the Crawl will be held at the Charles B. Washington Branch Library, 2868 Ames Avenue, from 5:30 to 6:30 p.m. Tara Evans and the Golden Thread Quilters, sponsored by Community Quilting Center Inc., will feature approximately 40+ quilts throughout the library. Both traditional and artistic quilts will be on display. Free snacks and refreshments will be abatable at each stop along the Crawl route. For more information, call 402-502-4669. As I was being interviewed for KMTV Channel 3 at the North Omaha Summer Arts Crawl, I could hear and see the artists and the community coming together, and the answers to the questions they asked could not begin to describe the beauty that I felt or saw. I was blessed to be in that position. 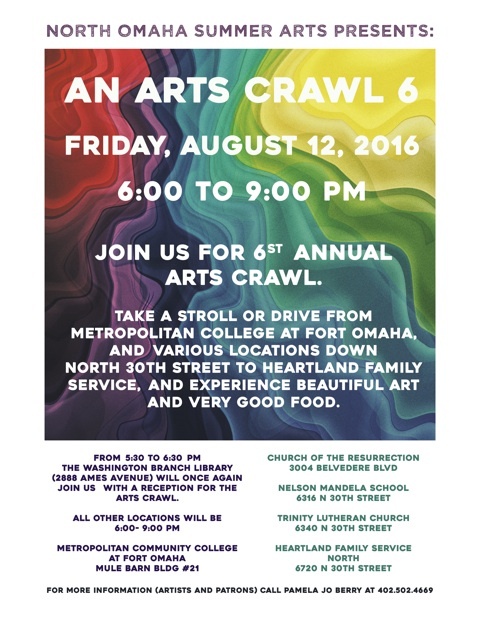 The true facts are that the North Omaha Summer Arts Crawl is Metropolitan Community College, Church of the Resurrection, Trinity Lutheran Church, Parkside Baptist Church, North Heartland Family Service and this year – the Washington Branch Library – opening their doors to allow art to bless the community. It is the community coming out to meet the artists and experience their art in different forms – visual, literary, performance, music and, this year, fashion. It is the volunteers that make wonderful food and give direction and stay around to help manage each venue and then help to clean up. It is all of the people that gave resources and contributions. It is all the people that took pictures of the event. It is all of the managers and the pastors that said yes. And for me it is a lot of prayer and listening and guidance. The North Omaha Summer Arts Crawl countdown is underway, so please clear part of your Friday evening to partake in this progressive arts tour. Whether you drive it or stroll it, you’ll enjoy a laidback night of inspiring art and artists. Sample great art and food at multiple venues. Visual art work by Bart Vargas, Michael Girón, Shea Wilkinson, Pam Hinson, Gabrielle Gaines Liwaru. Brett Henderson, David Guy and many, many more metro artists. Enjoy the handiwork of Omaha Fashion Week designers. View a community peace mural. Chill out to performances by Edem Soul Music Kegey, Kenneth Be, Marilyn Martinez and other musical artists. North Omaha native, resident and artist Pamela Jo Berry saw a need for more art to be infused into her community. So she dreamed up something called North Omaha Summer Arts (NOSA) in order to bring art in all its forms into that underserved neighborhood. With the help of partners and collaborators she’s made it a reality. This free, family-friendly arts festival for the community, by the community wraps up Year 5 with the annual Arts Crawl on Friday, August 14 from 6 to 9 p.m. The Arts Crawl happens at venues up and down and around North 30th Street. Take a stroll or drive from Metropolitan College Fort Omaha campus north to various churches to Heartland Family Service/Solomon Girls Center to enjoy inspiring visual art and soothing live music by artists from the community. Sample the work of artists in a wide variety of mediums and meet some of the artists sharing their work. Free refreshments and homemade snacks available at each stop. “I am very excited about the fifth annual North Omaha Summer Arts Arts Crawl.” Berry says. “From 6 to 9 p.m. we have five locations showing beautiful art and serving really good food. New this year, the Washington Branch Library is hosting a reception from 5:30 to 6:30 p.m. and there will be food and art there as well. • Washington Branch Library, 2868 Ames Ave. is hosting an Arts Crawl reception from 5:30-6:30 p.m. Enjoy art and refreshments at the library. “This year we wanted to make a mural about North Omaha,” Berry says. “It is a beautiful, vibrant place to live, yes. even with all the attention on the violence and the issue of poverty. There are sweet, peaceful neighborhoods, people of different hues, faiths and languages, families of all generations in the parks, community gardens and small forests. And there is art in all forms. The mural will be displayed at Trinity Lutheran Church during the Crawl. The North Omaha Summer Arts team invites the general public from all over the metro to come participate in this important milestone of 5 years bringing art to North Omaha. Discover art and artists in our midst whose work deserves wider appreciation and recognition. Before, during or after the Crawl, enjoy some of North Omaha’s other resources, including the Loves Jazz & Arts Center, the Carver Bank, the Union for Contemporary Art, the Bryant Center, Miller Park and the Malcolm X Memorial Foundation. Please Like the NOSA Facebook page and indicate you’re going to the event on the NOSA Arts Crawl Facebook Event page. For more information, email pamelajoh100@hotmail.com or call 402-502-4669/402-709-1359. North Omaha native, resident and artist Pamela Jo Berry saw a need for more art to be infused into her community. So she dreamed up something called North Omaha Summer Arts (NOSA) in order to bring art in all its forms into that underserved neighborhood. With the help of partners and collaborators she’s made it a reality. This free arts festival for the community, by the community wraps up Year 5 with the annual Arts Crawl- Friday, August 14 from 6 to 9 p.m. At venues up and down and around North 30th Street. Take a stroll or drive from Metropolitan College Fort Omaha campus north to various churches to Heartland Family Service/Solomon Girls Center to enjoy inspiring visual art and soothing live music by artists from the community. Sample the work of established and emerging artists in a wide variety of mediums. Free refreshments and homemade snacks at each stop. Washington Branch Library, 2868 Ames Ave. is hosting an Arts Crawl reception from 5:30-6:30 p.m. Enjoy art and refreshments at the library. Please come participate in this important milestone of 5 years bringing art to North Omaha. Your support is appreciated. For more info, email pamelajoh100@hotmail.com or call 402-502-4669/402-709-1359. P.S. Please pass the word to friends, family, colleagues. Like and share our Facebook page, https://www.facebook.com/NorthOmahaSummerArts. Visit and share our North Omaha Summer Arts Crawl Facebook Event page.